The ZAO Wou-Ki Foundation is a non-profit organization, dedicated to protecting the image of the late ZAO Wou-Ki and preserving the integrity of his works worldwide. 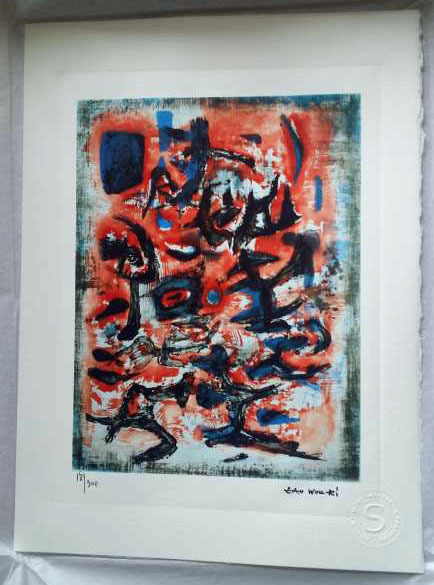 It has come to our attention that an increasing number of forged etchings bearing a fake signature of ZAO Wou-Ki, along with forged “certificates of authenticity” circulate on the market. These forgeries are based on photographs of certain artworks of ZAO Wou-Ki picked up from the Internet (paintings, works on paper, etchings) to make fake etchings, some of which are reproduced below. No certificates of authenticity pertaining to etchings have ever been delivered, either by ZAO Wou-Ki himself while living or by the ZAO Wou-Ki Foundation. No other person or entity is entitled to produce such a certificate of authenticity for any artwork created by ZAO Wou-Ki. We therefore strongly recommend being extremely suspicious as to any certificate of authenticity that could be delivered for the purposes of the purchase of any etching. This is a matter of utmost concern to the Foundation and highly detrimental to the interests and reputation of the late ZAO Wou-Ki. The Foundation is the only authority habilitated to certify the authenticity of any artwork attributed to ZAO Wou-Ki. A“Catalogue raisonné” of the etchings (comprehensive documentation gathering all the genuine etchings created by ZAO Wou-Ki) has been written by Jørgen ÅGERUP in 1994, entitled Zao Wou-Ki - The Graphic Work. A Catalogue Raisonné 1937-1995, Skørping, Heede & Moesturp, Danemark (237 p.), with an additional volume in 2000, Zao Wou-Ki, The Graphic Work 1995-2000, Skørping, Heede & Moesturp, Danemark (15 p.). It is therefore advisable that any prospective sale or proposed public display/exhibition of an artwork attributed to ZAO Wou-Ki be immediately brought to the attention of the Foundation, in order to ensure the authenticity of the artwork. Perpetrators of artistic forgeries and any dealer or agent who would have knowingly concealed, offer for sale or put on the market such items are punishable by 2 years' imprisonment and a fine of 75.000 € without prejudice to the payment of damages (French Act of 9 February 1895). We look forward to your cooperation and thank you for assisting us in our continuing fight against acts of forgery and counterfeiting that are highly damaging to the reputation of the late ZAO Wou-Ki.